Endings | Do YA Read? …they leave me feeling relieved, angered, joyful but, when it comes to the ending of an excellent series, it is bitter-sweet. I know the story can’t go on forever but, when you’ve gotten to know the characters and fallen in love with their stories, it’s really difficult to say good-bye to favorites like Katniss and Gayle (The Hunger Games), Katsa and Po (Graceling), Gregor and Luxa (Gregor the Overlander), or, most recently, Deryn and Alek from Scott Westerfeld’s Leviathan Trilogy. However well (or, occasionally, frustrating) the author wraps up the story, I still hate to put them away. Westerfeld’s steampunk (have I mentioned before how very much I love steampunk!!!) story starts out with a young girl and her dream to fly in the British Air Service. Deryn Sharp was raised by her pilot father who died in a fiery crash while saving her life. When her brother enlists in the service, they decide that she should disguise herself as a boy cousin of theirs and join up, as well. Almost immediately, she makes a lasting impression on the crew and captain of Leviathan, a living breathing airship that looks much like a whale. She is a Darwinist. At the same time, Alek, a Clanker, is fighting his own battles. His parents are murdered, bringing war to his home country, Austria-Hungary, and sending him into exile. He is unprepared for his new life on the run but knows that he must survive if he is to return triumphant to his people. Deryn and Alek are brought together when an accident threatens to destroy Leviathan and all who sail her. The next book, Behemoth, takes the pair into battle in the Ottoman Empire, more Clanker technology and secrets that might just destroy their friendship. Goliath brings revelation and strain to Deryn and Alek as they continue to fight to end the Great War. In all three books, the histories are altered but many of the secondary characters and situations in which they find themselves are based in reality. 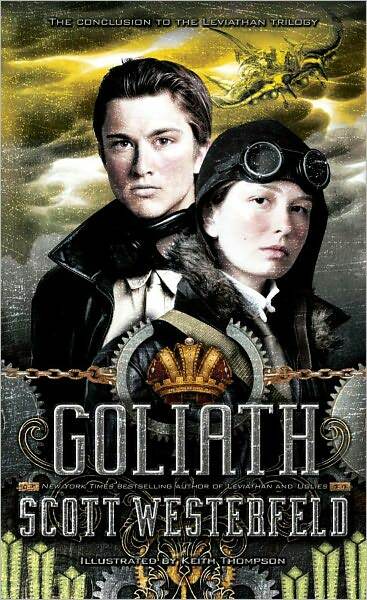 In Goliath, we meet Randolph Hearst, a conniving yellow journalist, Poncho Villa, and Nicola Tesla, inventor and mad man. As I read, I found myself going to the internet and looking up different people and events to see what the real story was! I do love how Westerfeld includes Author Notes where he explains the realities of his stories. It’s almost as much fun to read as the rest of the book. So, while I’m sad that their stories are over, I bit a fond farewell to all of my favorite couples and hope “happily ever after” finds them all!! !